There are many different parts of a wedding day and it is our pleasure to be part of capturing each one. We often cry at a wedding during the speeches or during the father daughter dance when we see the emotion of the dad's face as he remembers the years past of raising his daughter. It is wonderfully important to us to take pictures of the wedding gown, the bride all dressed up, the groom in his tuxedo, the bridesmaids and groomsmen, the ceremony, some traditional wedding portraits and the reception but to cap it all off we love to take the couple out at the end of the night for some night photos. 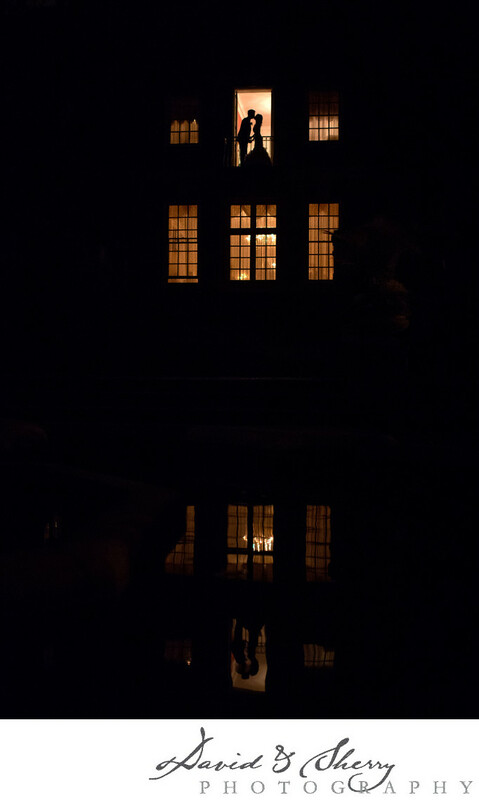 During this wedding at Graydon Hall Manor we were able to get the bride and groom to get together for a silhouette in the bridal suite balcony on the second story and we used the water from the fountain in the courtyard to reflect the image lit above by the interior lights at the Manor in order to make a double reflected image. This gives a beautiful look for the last page of the wedding album. We laid this out as the feature of a double spread so the wedding photos were prominently displayed as you turned to the last page. Graydon Hall offers this kind of variety with their open yard in the back with grass and trees, courtyard by the building and decor throughout the 1920s mansion. When we are thinking through the wedding photos portion of the day we are looking to create an eclectic mix of photos that will satisfy the wants of the parents and in-laws as well as the bridal party and bride and groom. We use the top of the line Nikon gear and will choose the right lens and focal length to accomplish the composition we are looking for. Location: 185 Graydon Hall Drive, Toronto, ON, M3A 3B1.